This ancient surname is of Olde English pre 8th century origins deriving from the word 'boeccure'. The surname is always occupational, but not always for a maker of bread. There are a number of possible origins and these include an official with special responsibilities for the baking ovens in a monastery or castle, as well as the keeper of the 'communal kitchen' in a town or village, since most of the humbler households had no cooking facilities other than a pot over a fire. The right to be in charge of this service and to exact money or loaves in return for its use, was in many parts of Britain, a hereditary feudal privilege. Less often the surname may have been acquired by someone noted for specifically baking fine bread or as an owner of a kiln for the baking of pottery or even bricks. The surname is first recorded in the late 12th Century, and early recordings include such examples as Robert Bakere, a witness in the Assize Court Rolls of Lancashire for the year 1246, and Walter le Backere in the rolls of the county of Hampshire for 1280 a.d. The female form of the name is 'Baxter'. 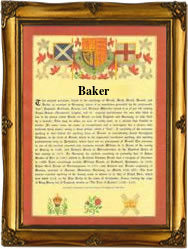 There have been no less than forty two 'Baker' entries in the "Dictionary of National Biography", and during the latter half of the 19th century the name was arguably the most famous in the country. This was owing to the exploits of Sir Samuel Baker, who with Stanley and Livingstone, was the greatest African explorer, and his brother, Valentine Baker, the famous Cavalry leader, known world wide as 'Baker Pasha'. The first recorded spelling of the family name is shown to be that of William le Bakere, which was dated 1177, in the "Pipe Rolls of Norfolk", during the reign of King Henry 11, known as "The Builder of Churches", 1154 - 1189. Surnames became necessary when governments introduced personal taxation. In England this was known as Poll Tax. Throughout the centuries, surnames in every country have continued to "develop" often leading to astonishing variants of the original spelling.